Having enjoyed two European trips escorted by you, I can say from experience that they are indeed very special events. We enjoyed extraordinary experiences and were able to meet fascinating people and get entrees to places, which without your contacts and knowledge, would never have otherwise been possible. One certainly doesn't need to be a car fancier (although it does help!) to have a thoroughly absorbing and entertaining time - the places are so rich in culture, cuisine and history that the car side of things just adds to it all. During our two trips we got on so well with everyone that it became two weeks of parties strung over exotic places. Please don't hesitate to send this note out to your data base and invite anyone to call me if they want a customer's viewpoint. I haven't been to all the places mentioned on your itinerary but to many of them. It must be said I'm madly in love with northern Italy. But then there's the museums elsewhere too...Incidentally, we had no issues with the driving - definitely the best way to see it all by far! These trips beat the formulaic, everyone's done or doing one type offerings by a country mile. So much more unique, intimate and bespoke. Incidentally, when in Como ride the public ferry - great trip. 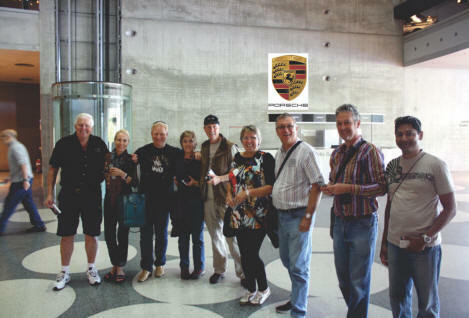 "Paul Blank is the ideal tour guide that you could wish to have for any European motoring tour. A great depth of knowledge and experience of collections, museums, factories and motor sport events, and of the great marques and cars that made up the history of motoring across the 20th century. He also has invaluable recent on-the-ground experience, of all the places we went to on our tour. " Louise Collibee has travelled the world extensively and has lived in Perth and Sydney in Australia, in London, New York and presently in Connecticut, USA. I participated in “The Ultimate Grand Prix Experience” in 2012. As a part of the May 2012 tour, we travelled through France, Italy, Switzerland and Germany. I was absolutely delighted with the calibre of the tour participants, and in fact I made some great friend’s amongst the guests. There was not one, but many truly spectacular moments to remember the tour. The greatest being the Formula One Drive... As a female driver, I was quite nervous at first but quickly settled in to the driver training classes - I found this took the edge off my underlying fears. The drive ended up being one of the most exhilarating experiences of my life. The fear quickly turned into thrill seeking and it was spectacular, fun beyond my imagination. I finished the drive wishing I had gone faster and wanting to take 10 more laps. The training and track were well organized, every stage of the experience mapped out in a professional manner. The facility was amazing with a huge variety of F1 and F3 cars on show. We watched the classic cars at the Monaco Historic Grand Prix. I have never seen such stunning antique race cars. The setting is sensational. You can’t but have a fabulous time in Monte Carlo. The track was surprisingly easy to get to. We decided to walk around a fair bit so as to not miss any of Monte Carlo. The sound of the F1s coming around the curves was exhilarating and the viewing outstanding. An amazing experience. The Mille Miglia is truly the Ultimate in Classic Car experiences. It was one of the most incredible collections of cars ever shown in one place. There were cars that were gob-smackingly stunning. I loved all the Gullwing Mercedes-Benzes. The little town of Brescia is a wonderful backdrop to show off some of the most beautiful vehicles. The beginning of the race made you want to enter your own vehicle. I absolutely loved it and wish I could do it again. It is hard to explain, but simply a must see. Museo dell’ Automobile, the Schlumpf that were also spectacular. I could visit every town and every museum over again. The Nurburgring was another incredible place. I did not drive the track, however I noticed the participants who did, said it was one of their favourite experiences on the tour. The Hotel was fab - comfortable and convenient with a view trackside. Truly a memorable experience I would highly recommend to race track drivers. I thoroughly enjoyed the accommodations throughout the tour. The best of which I thought was the hotel in St Tropez. We stayed in a couple of hotels that I would add to my own travel collection and absolutely use them again. In all I felt the trip went very smoothly with plenty of free time to do as you pleased and enough action to attend whatever you wished. I experienced some of the most thrilling, sensational car spectacles and drives of my life. I wish I could do the Ultimate Grand Prix Experience every year! I would highly recommend this to family and friends for truly incredible experiences and memories. Congratulations on having the vision to conceive The Ultimate Grand Prix Experience and the courage and expertise to transform it from concept to sensational reality. Jose' and I have toured the French Riviera previously so had some idea of what to expect this trip but found that through your intimate knowledge of and unbridled passion for this region our trip was a truly exciting and memorable experience significantly beyond our expectation. The Monaco F1 race was a definite highlight and although viewing is difficult at best the atmosphere is electric and having access to the track and pits after the race was an added bonus. Our Merc SLK convertible was simply perfect for the conditions and we received plenty of envious glances from other holiday makers. The versatility of having our own transport meant that we could take things at our own pace and linger where we chose without feeling pressure to keep up with the group. The road book you provided was invaluable it instantly turned Jose' into an expert navigator and took all the stress out of finding our way around in an unfamiliar environment. The F1 track day was beyond belief, the professionalism and meticulous attention to detail at the driving school was precisely what I would expect of a F1 race team. The attitude of the instructors coupled with their claim that no one has been seriously injured at the facility had an enormous settling effect on me such that following completion of class room instruction and F3 track familiarization my nervous anticipation was down to a point where I was ready to be calmly strapped into the F1 cockpit and fully enjoy the experience of F1 power. If I was calm getting into the car I certainly wasn't when it was time to get out, I had jelly for legs and the fabulous sensation of every nerve in my body tingling. Jose' had come along to watch but got so caught up in the excitement that when the F1 two seater magically appeared there was no holding her back and she was strapped in and taken on the fastest ride of her life and the grin hasn't worn of yet. Congratulations on your choice of accommodation Jose' and I found that it was of a high standard, generally the best available and always well located, even those that may not have been the best available such as in St Tropez when we were bumped out by Rallye des Belles had charm and character that enhanced our experience. Your choice of restaurants was superb, your obvious intimate knowledge of the region meant we dined at places and enjoyed the taste of local provincial dishes that touring alone we would be unlikely to have found, so for us the tour was also a wonderful culinary experience. Clearly this was not a cheap tour and Jose' and I had some reservations prior to committing unconditionally, fortunately however we did commit and are now convinced that for us not only was The Ultimate Grand Prix Experience a trip of a lifetime with memories that will last forever, it also represented great value for money. Paul, thank you for creating The Ultimate Grand Prix Experience, Jose' and I wish you well with it and hope it continues to be a success for you for many years to come. You have my express permission to use any or all of this letter as you see fit, also should you have prospective customers who wish to speak to a previous Experience participant, please feel free to pass on my contact particulars as I will be happy to oblige.